Robin writes "Optimism bias is clearly not an unnoticed accident - people want to be so biased." There is plenty of evidence that those with the optimistic mindset are happier, healthier, and more successful, but of course we have to be careful because the causality runs both ways. (If life has been good to you, you will tend to expect more of the same). But (while I don't have cites on hand), I've seen some research on interventions to improve optimism, and on predicting later success based on earlier optimism (controlling for other obvious factors of success), which suggest that at least some of the causality runs from optimism to happiness. It seems a bit sad to me that our egos need such nurturing, and as a rationalist I worry that optimistic bias (like any false view of the world) will sometimes lead us to make worse decisions which will increase suffering. But to the degree that we're stuck with the biased minds we have, the evidence seems to be that it's better to be optimistic than pessimistic. Participants prescribed (and described) more optimism (a) after commitment to a course of action rather than before (b) when the decision to commit was the protagonist's to make rather than not, and (c) when the protagonist's control over the outcome was high rather than low. ... The results were also largely robust across the settings we sampled ... [and] across key measured variables. Interestingly, even participants who were self-identified as pessimists ... prescribed optimism ... Although Asian participants prescribed less optimism than any other ethnic group, they still prescribed optimism. Optimism bias is clearly not an unnoticed accident - people want to be so biased. But this is only one way of looking at the amplitude distribution - a way that makes it easy to see objects like humans, sensors, and atoms. There are other ways of looking at this amplitude distribution - different choices of basis - that will make the decoherence less obvious. RepRap is short for Replicating Rapid-prototyper. It is the practical self-copying 3D printer shown on the right - a self-replicating machine. This 3D printer builds the component up in layers of plastic. This technology already exists, but the cheapest commercial machine would cost you about 30,000 Euro. And it isn't even designed so that it can make itself. So what the RepRap team are doing is to develop and to give away the designs for a much cheaper machine with the novel capability of being able to self-copy (material costs will be about 400 Euro). 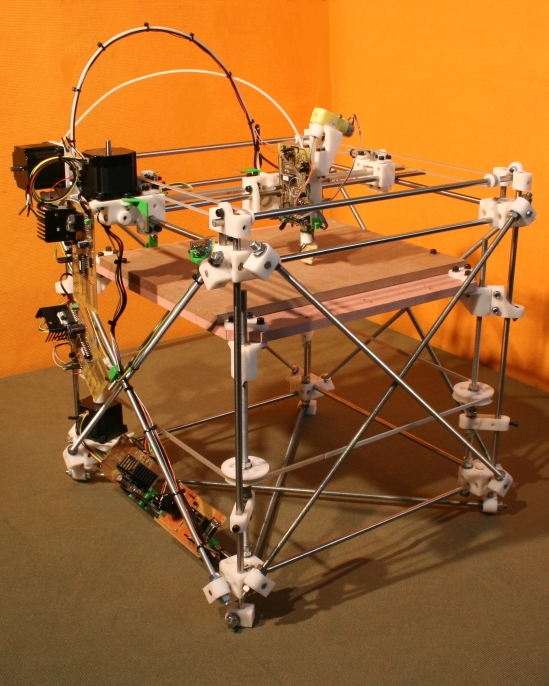 ... We are distributing the RepRap machine at no cost to everyone under the GNU General Public Licence. ... We hope to announce self-replication in 2008, though the machine that will do it - RepRap Version 1.0 "Darwin" - can be built now. Yesterday's post argued that continuity of decoherence is no bar to accepting it as an explanation for our experienced universe, insofar as it is a physicist's responsibility to explain it. This is a good thing, because the equations say decoherence is continuous, and the equations get the final word. Decoherence is implicit in quantum physics, not an extra postulate on top of it, and quantum physics is continuous. Thus, "decoherence" is not an all-or-nothing phenomenon - there's no sharp cutoff point. Given two blobs, there's a quantitative amount of amplitude that can flow into identical configurations between them. This quantum interference diminishes down to an exponentially tiny infinitesimal as the two blobs separate in configuration space. "A human researcher only sees a particle in one place at one time." At least that's what everyone goes around repeating to themselves. Personally, I'd say that when a human researcher looks at a quantum computer, they quite clearly see particles not behaving like they're in one place at a time. In fact, you have never in your life seen a particle "in one place at a time" because they aren't. Nonetheless, when you construct a big measuring instrument that is sensitive to a particle's location - say, the measuring instrument's behavior depends on whether a particle is to the left or right of some dividing line - then you, the human researcher, see the screen flashing "LEFT", or "RIGHT", but not a mixture like "LIGFT". Physicists mostly punt to philosophers, who use flimsy excuses to declare meaningless the use of specific quantum models to calculate the number of worlds that see particular experimental results. ... Two recent workshops here and here, my stuff here. Make two subsidized real-money markets on the stock price of each Fortune 500 firm, one market conditional on its CEO stepping down by quarter's end, and the other conditional on not stepping down. The difference between these two prices would advice the board on dumping the CEO. If active, these markets should attract business press, and then most of these CEOs would come to see what the markets say about them. Half a million would pay for legal/admin. The other half would only cover a $1000 subsidy per firm, but CEOs trying to manipulate would add lots of liquidity. A few years of data would let us clearly compare the returns of firms following market advice to firms not following. With clear data I'd encourage shareholders to sue boards ignoring market advice, and after a few wins most boards would weigh market advice heavily. A revolution in CEO accountability would then be complete, all for only a million. Technically, I'd also create a third market per firm in the chance the CEO will step down, and force the three prices to be consistent with external stock prices, so there'd only be two independent degrees of freedom.